Most art “historians” claim that Gustave Caillebotte, French Impressionist, was not known outside of France until after the middle of the 20th century. That simply isn’t true. Even in the small Texas town of Waco, Texas his death was noted in the Waco Evening News on March 26th, just barely a month after his death. 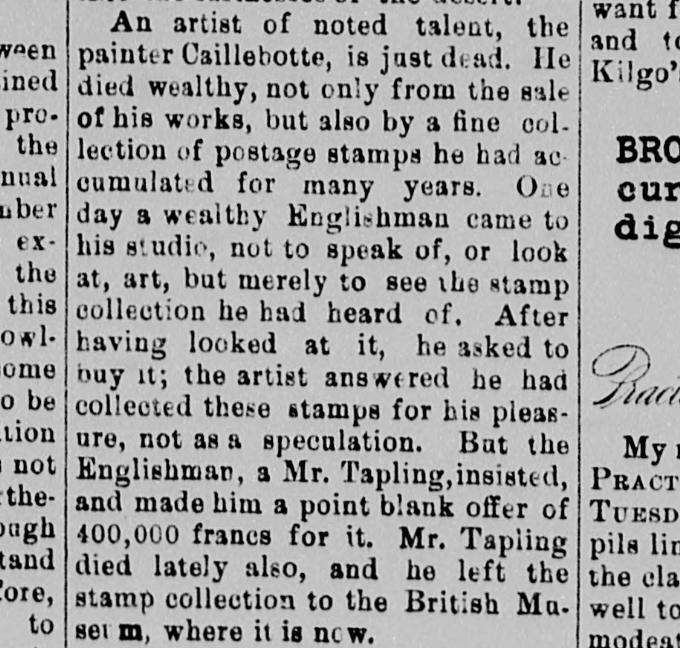 Here is the portion of the article noting his death, in 1894. Caillebotte Connection to Napoleon Bonaparte. On 18 Dec 1819, Jules Pinson de Valpinçon, the 1st cousin and namesake of my great-grandfather Jules de Launay, married Adrienne Biennais at Église Saint Roch in Paris. Adrienne’s father, Martin Guillaume Biennais, created the 1804 crown jewels for Napoleon Bonaparte which are now on display at the Louvre. Both of these Jules were 2nd cousins of the father of the French Impressionist artist, Gustave Caillebotte. In 1860, Gustave’s father, Martial Caillebotte, purchased property at Yerres for 134,000 francs plus about 9,000 in fees, from the Biennais Estate. This property is where Gustave did many of his paintings. So it was quite literally a sale between cousins. Adrienne Adelaide Biennais – Madame Jules Valpincon. Grave is locate near the Caillebotte tomb in Pere Lachaise cemetery.